The supplement is available online at the AJPM website. 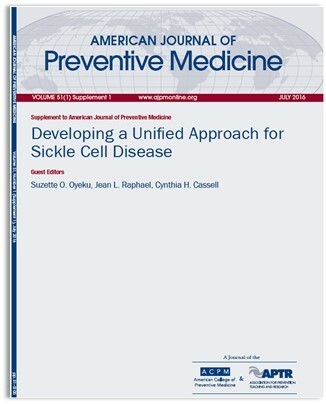 The American Journal of Preventive Medicine (AJPM) today published a supplement supported and coordinated by the Centers for Disease Control and Prevention (CDC) describing sickle cell disease (SCD) research activities that have made significant strides during the past decade toward improving the care and treatment of those living with SCD. SCD is a group of inherited red blood cell disorders that affect millions of people worldwide. SCD can cause pain and other serious problems, such as infection, acute chest syndrome (a serious lung-related complication that causes lower oxygen levels in the blood), and stroke, and can lead to lifelong disabilities and reduce average life expectancy. The articles highlight the public health impact of SCD, and all the critical scientific work that is being done to reduce the burden of SCD on people living with the condition, as well as their families, healthcare providers, and healthcare systems. The primary audience for this supplement includes healthcare providers, such as primary care providers, hematologists, and pediatricians who provide care for children with SCD, as well as hospital leaders. Others who may benefit from this information include public and private insurers; radiologists and radiology technicians; pain management specialists; emergency care providers; quality improvement practitioners; health services researchers; hospital administrators; policy makers; IT developers; public health professionals; sickle cell advocates; patients, families and caregivers; and the general public. What led to the development of the supplement? The unknown number and characteristics of people living with SCD. Enhancing the role of the community. The papers in this journal supplement highlight key improvements made since the Sickle Cell Summit in the targeted areas described above, and achieved through activities sponsored by the CDC, the Health Resources and Services Administration (HRSA), and the National Institutes of Health (NIH). What is included in the AJPM supplement? Shows that many children with SCD don’t receive important preventive services despite the availability of evidence-based interventions to prevent several serious complications of SCD, including pneumococcal vaccine to prevent chronic neurologic disability and transcranial Doppler monitoring and subsequent treatment to prevent early stroke. What is CDC’s role in the supplement? CDC initiated the supplement and coordinated with the AJPM and the authors during the manuscript development process. CDC also funded Open Access so that the articles will be available to everyone, free of charge. SCD is a priority area for CDC. Many strides have been made, yet more work is to be done. CDC is committed to applying the findings from work done on SCD toward improving treatment and services for those with the condition. Spread the word! We encourage you to share information about the supplement with your colleagues and friends. We will be promoting the supplement on Twitter at @CDC_NCBDDD. We invite you to comment, re-post, re-tweet, and follow @CDC_NCBDDD! For more information about SCD, please visit http://www.cdc.gov/ncbddd/sicklecell/index.html. Thank you for your continued support and for your interest in learning more about this condition.